One of the most frequent questions we have been asked lately is, "What about the $29.99 juicer that's available at my local Department Store? Is that as good as the juicers you sell?". In general, our answer is always, "NO, it is not as good as the ones we sell". Due to our experience with juicing appliances, we find that most juicers sold in department stores for under $50 are under powered and more difficult to use. We are now backing up our statements with an in-depth test that we conducted. Before getting to the tests, lets take a look at the construction of the two machines. Both machines are made of plastic and stainless steel material. The Lequip uses more stainless steel in its construction. In the picture, you can see the juice collection bowls. The Lequip is stainless steel with a small plastic lip, whereas the Hamilton Beach unit is all plastic. The stainless steel makes the Lequip juicer much easier to clean. The Plastic of the Hamilton beach will stain over time. You can see in the picture above the size of the cutting blade and strainer of each juicer. (An apple in the picture is used as a reference for size.) The Lequip part is 5.75" in diameter, and the cutting portion is 3.5" in diameter. The Hamilton beach is 4.5" in diameter, and the cutting portion is only 2.5" in diameter. We did a direct comparison with the juicing of carrots and pears. You can see the results of the test in the table below. As you can see from the table above, the Lequip 110.5 produced 12.5% more juice when juicing carrots and 16% more when juicing pears. Of course, results will vary depending on the produce being juiced. In this instance, due to the loss of yield with the Hamilton beach juicer, the extra yield would have cost 29 cents when juicing the carrots and 41 cents when juicing the pears. You are throwing away money every time you juice! 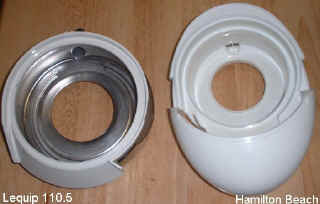 Juice Quality- The Hamilton beach juicer has larger holes in its strainer basket, so it lets more fiber into the juice. This will affect the yield by artificially inflating it. The pear juice that was made with the Hamilton beach juicer was "gritty", like drinking water with fine particles of sand in it. It wasn't a smooth juice, like the one made in the Lequip 110.5. Clean up- The Hamilton beach was harder to clean, due to a number of factors. The juice bowl is an odd shape with a lip on it that seemed to catch all the pulp, thus, making it harder to clean. It's also made out of a white plastic that will stain over time. The Lequip bowl, on the other hand, is made of stainless steel which is much easier to clean and keep over time. Pulp Collection - The Lequip pulp collection bin is larger (56 ounces) and was much easier to line with a plastic bag, thus, easing cleanup. The collector on the Hamilton Beach is only 40 ounces. Ease of Use - Every carrot had to be cut before being fed into the Hamilton Beach juicer, while virtually no carrot needed to be cut to be fed into the Lequip mini juicer. This cut down the time needed to juice. The Hamilton beach juicer also seemed to splash juice on the counter as it came out of the spout. Noise Level - The Hamilton beach juicer was over 10 Decibels louder than the Lequip mini in our Sound test. Do you want a loud juicer? We have heard people say that some juicers "Sound like an airplane taking off". Warranty - The Lequip juicer warranty is 5 years longer than the Hamilton beach juicer. We feel a juicer should be a lasting investment for your money. Size of Feed Tube 2.25" x 1.125" 2.75" x 1.5"
Comments The juicer appears "flimsy" and light. The larger holes in the juice screen make a less desirable juice with more particles. The lower powered motor is prone to be "bogged" down, and the plastic will tend to stain easily. With its large feed chute, and simple design, the Lequip Mini is easy to clean and use. The Stainless Steel bowl is a feature not usually seen on juicers of this price range. most importantly, a 5 year longer warranty. Why do you think the longer warranty is important? Because juicing has changed my life. It was my first step in adopting a healthy lifestyle. Many of our customers report weight loss, more energy and just "feeling better" after drinking FRESHLY made juices on a daily basis. If you purchase a "cheap" machine now, and it breaks in 1.5 years (when it will be out of warranty), you will need to spend more money on another juicer. If you invest in a Lequip Mini and it breaks down anytime during 6 years, it will be covered under warranty. This alone, in my opinion, justifies the extra cost of the machine. Many stores try to sell "extended" warranties. We all know how much they cost... Just purchase a juicer with a long warranty in the first place, and don't worry about the expensive extended warranty. The Lequip juicer is made by a company that specializes in juicers, whereas the Hamilton Beach company makes a wide variety of kitchen appliances. Public Service Announcement: The U.S. Consumer Product Safety Commission has recalled certain models of the Hamilton Beach Juicer. Click here for further information.